There was a meeting of Abingdon Town Council this evening. 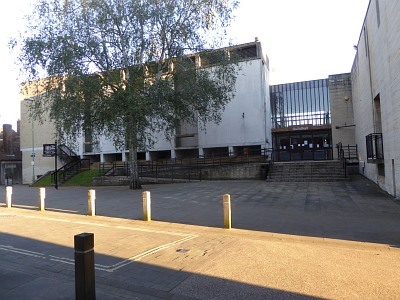 There had been a meeting of the Guildhall Committee, back in July, that outlined plans for the Guildhall redevelopment. The final plans will be agreed in November. The Town Council heard about progress on these plans from the architect this evening. The main points are that there will be a new transparent (glass) entrance at ground floor level, down to the left of the picture, into what is currently the old unused cloakroom area, and backstage. That entrance area will have a bar area with tables, a reception, and a community space. Opposite the new ground floor entrance, new stairs will be added, and the existing lift will be refurbished. Where the big old stage is currently (left of building), there will be rooms on three levels including community spaces, and storage, accessible by stairs or lift. The current Abbey Hall will be designed as an acoustic box to allow cinema or performances, that won’t disturb neighbours. It may have raked seating, and the new stage, and cinema screen, will be opposite where the stage is currently. A new platform lift, at ground level, will access the older Guildhall rooms . 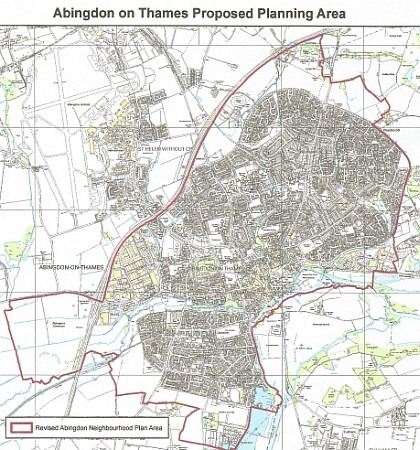 The Town Council are set to undertake a Neighborhood Plan for the Abingdon-on-Thames area and have drawn up new town boundaries. They include the Drayton Road development; and green belt areas in North Abingdon set for development in the Vale of White Horse District Council’s Local Plan. The red line also takes in an area, the other side of the A34, known as Abingdon Common. * Abingdon Fair Service at 8pm on 4th October. * Les, the Residents Parking Warden is retiring next week, and there will be a reception for him. This sounds a lot better and more pragmatic (budget sensitive) than the previous plans for the Guildhall, though I’d like to hear of detailed thoughts on the proposed function of the new spaces as just having created new rooms is not a solution. It’s not the format of a building that makes it useful and it is its functionality which makes/or breaks its popularity. ‘Form follows function’ has been abused, but there’s truth there … so tell us about the functions (what’s going to happen that’s going to be good) and why the design and set-up of these rooms is going to facilitate a ‘hive of communal activity’. Sounds as though most of the money spent on previous structural design and planning may have gone down the Swanee. And a Neighborhood Plan …! My cup runneth over. As long as this is not just another club for the usual suspects and has proper channels for democratic input, which is considered in a manner open to the whole community and not just shelved as ‘consultation done, let’s plough ahead’ then this could be a massive step forward for the Town, though we need more details on the scope of the plan. What is a neighbourhood plan? What is it for? What does it do? Tried to post web address (this site will not accept the web address), but you’ll get to an explanation if you google ‘What is neighbourhood planning/’ and go for the government planning portal site. ‘Neighbourhood planning gives communities direct power to develop a shared vision for their neighbourhood and shape the development and growth of their local area.’ etc. You will find out about it here. ….so…is it worth reading, or is it, as you suggest, just yet another layer of veneer, to be ignored? I don’t think I have the capacity to get agitated about something else…. So I don’t want to read it if I don’t have to…. Daniel, IF it’s done properly it could be a big improvement. There are a lot of bright people around town who don’t necessarily want to sell their souls to a political party and might want to get involved in an NP scheme. After all, competence out-trumps political ideology any day of the week. Newcomer – you are absolutely right – the great thing about a NP is that it is a requirement that there is “community engagement” right from the start i.e it is not possible for the TC to go it alone and draw it up, then consult afterwards. The first step after defining the area (which they have started, but which, believe it or not, has to go out to a 6-week consultation – niot their fault!) is to set up a Steering Group, with representatives from across the community. That group then has to put in place arrangements for extensive consultation at all stages – Wantage for example have had abot 3 rounds of consultation – AND consequent revision! So as you say, this could be a great opportunity for those people with constructive ideas – and/or useful skills and experience – to make a meaningful input. Congratulations to the TC for deciding to go ahead. This sounds great. But…. What good will it be to us if a developer with access to the country’s best planning lawyers, and very deep pockets wants to, say, build a park and ride in Abingdon with the full backing of the CC and/or government? Will it protect our town from ‘them’ ….or will it, in fact, just stop Joe Bloggs building a granny annex for his elderly mum? Don’t we already have wonderful legislation and protections in place? But the balance of power is in favour of the developer not us. So…. Now we’re going to have another smearing of expenditure….to give the same, only different protection. But this will work this time. No, really, it will…. Sounds like a good idea. I just don’t know what it gives us that we don’t have already…. Or, indeed, what we should have already. Congratulations to the Town Council. Now we will all have a chance to have our say on Abingdon’s future. Don’ t sit on the sidelines – get involved in developing our Neighbourhood Plan. newcomer – I think this Guildhall scheme is much more realistic. It is based much more on making the best of the current structure than on spending millions to add to it. We are yet to get full costings, and until that point we can’t decide whether it is affordable. On your point about the money spent previously, you have a fair point, but we have also made sure that we have used the work that had done previously as far a was possible. The architects and quantity surveyor have been very helpful in that respect. Your point about functionality is an important one. Our aim is to create as many different usable spaces as possible in order to maximise the potential use, while making sure that what we are doing would remain usable by existing and previous users. Overall our thinking is that the job of the Town Council is to provide as good and flexible as possible facilities as we can and then encourage community groups and other organisations to make use of the space. There are still a number of ‘optional extras’ that will depend on the overall cost and affordability and have yet to get full reports from the structural engineer and acoustic engineer that may affect what is feasible. Neil, I think that a wish for maximum flexibility in the functionality of the building is one of the reasons why this project has stuttered along. I suppose it’s understandable self-preservation on the part of politicians not to want to upset any special-interest pressure group, but trying to please everyone when it comes to a bricks and mortar will lead to, well, a ‘Tower of Babel Situation’. Unending compromises to try to please everyone are just the Devil’s work and everything just grinds to a halt. What I would have done, as explained to a fellow councilor of yours shortly after it was announced that the TC had acquired the Guildhall (this was the first mistake) is to have invited all of the promoters operating in council/small entertainment venues in the South of England to view the Guildhall as was and ask them what money would have to be spent on (acoustics, toilet facilities, bars, back stage, etc) to make the venue interesting enough for them to book their shows, acts, etc into the Guildhall. This would be advice from people whose living is made from understanding what entertainment worked in towns like Abingdon. I stressed that no one on the council should be allowed to imagine themselves an entertainment entrepreneur and try and do it themselves. Entertaining people consistently is difficult and throwing dinner parties that your friends tell you are ‘marvelous’ doesn’t make you Val Parnell. Having obtained this advice and followed it the TC should them have invited several promoters to place acts/shows at the venue, such entertainments covering a broad demographic. No one promoter should be given exclusive rights to the venue. The council should then have faded into the background and acted as a facilities manager, renting the venue to promoters who would have put on the entertainments and taken all the associated risk. But this would have been far too easy …. Had this been done at the beginning we’d probably have a functioning Guildhall by now AND a proper cinema in Bury Street (something else I suggested). This plan would be somewhat blunted now as much of the original money has been frittered away, but the underlying principles are the same. 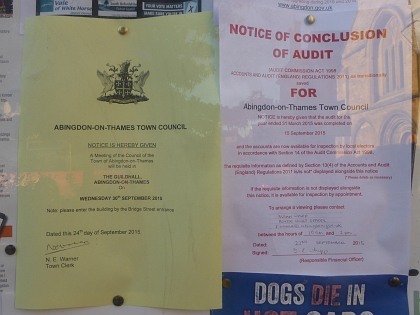 Well….THAT sounds like the kind of plan and thinking that Abingdon needs (needed). Please could the council spend a lot of money on a consultant to read this blog and perhaps come up with similar ideas at great cost, rather than ask or find out that a perfectly good suggestion may be available ‘for free’? …please, anyone responsible for the future of the now farcical guildhall situation, I implore you to at least pay heed to what newcomer says above. If you actually want what is best for Abingdon, rather than some other motive, please….if not tap into the above, at least switch to a similar tack, or the bloomin consultants you spend out on next time have similar knowledge and know how to that available for free within the community. 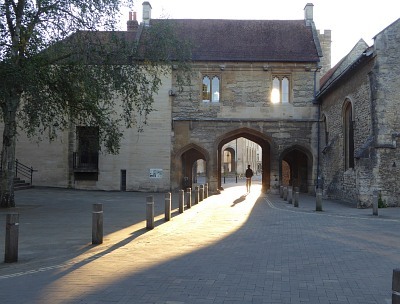 I don’t want a well intentioned but unkowledgeable committee to do what they think….I want the best ideas and the best people to help deliver the best use for the guildhall.